This is the first of three articles by the Rev. Carolyn Moore on women in Scripture and in ministry. As a pastor, as one called to the ministry of church planting, and as a woman, I am inspired and challenged by those great matriarchs of the faith who proclaimed the gospel of Jesus Christ. Jesus himself chose a woman to be the first preacher of the gospel. It was Mary to whom the resurrected Jesus said, “Go and tell the others” (John 20:17). Women were evidently leaders in early house churches. The home, which was the domain of women, was the primary location of the early church and it is this location that shaped its early identity as a “family,” and as a message of freedom from oppression in all its forms. 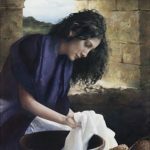 The New Testament narrative clearly notes the integral role played by women in the development of the first-century church, and it is surely no coincidence that after Paul meets Lydia in a gathering by the river and presides over her conversion, she invites him into her home (Acts 16:1-15). But what of those passages in Paul’s First Letter to the Corinthians (14:34-36) and in his First Letter to Timothy (2:12), often cited to discredit women as leaders of men and as preachers? These passages must be read within the context of the overall message of the Bible. They must be read through the lens of Deborah’s story, through the lens of Mary’s charge, through the lens of Galatians 3:28 (“there is neither Jew nor Greek, slave nor free, male nor female”), and the lens of Priscilla and Junia who labored in the gospel with integrity. God has surely not called all women into vocational, pastoral leadership (just as he has not called all men either), but he has surely called some. The Bible itself testifies to this. They were clearly partners in the proclamation of the gospel, and this partnership is embedded in the creation story. Men and women fulfill each other’s contributions to the Kingdom. Male and female are partners in the work of realizing God’s Kingdom on earth. In some obvious ways men and women complement one another, and in all ways they are in partnership. Without exception, the Bible must be read within its historical context. Paul’s letters are not bound historically, but they are rooted historically. What we know about women in the world of the first century is that they were seldom if ever given the opportunity to lead. They were largely uneducated. They had little or no experience in speaking and leading at public gatherings. But in the early church they found freedom they had not experienced before, and Paul’s instructions were instrumental in making that possible. He fostered a climate where women were educated, encouraged to ask questions, and to lead. In his letters, he honored a number of women partners in the proclamation of the gospel. For all of us, Jesus’ words carry much weight. His commands and charges at his resurrection were all gender-neutral. “Go, make disciples” (Matthew 28:19). “You will be my witnesses” (Acts 1:8). And, “Take up your cross and follow me” (Matthew 16:24). These commands and commissions were not spoken to only half an audience in the first century; likewise, they are not spoken to half an audience today. Contemporary women church planters owe much to those first-century evangelizing women who embraced the whole gospel, believing Christ had called them to proclaim the good news. The first-century church proved that when men and women work together to build the Kingdom of God, operating in freedom and in the power and giftedness of the Holy Spirit, the effects of the Fall are reversed, and the glories of the gospel are made manifest.